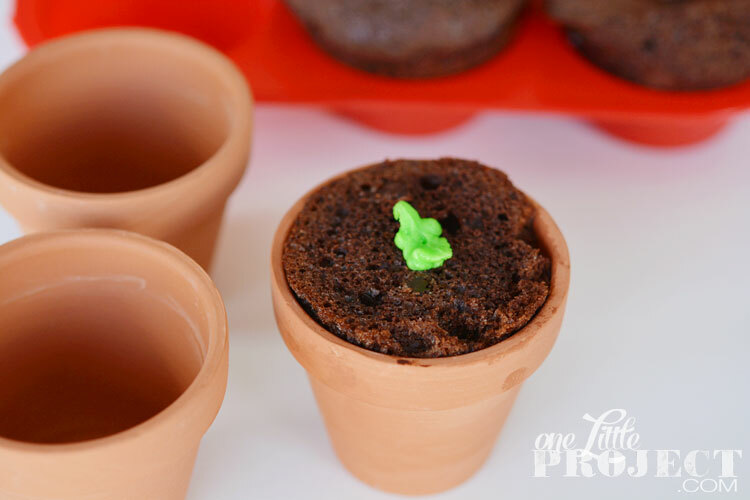 These spring time budding cupcakes are so easy to make! 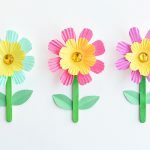 And they are such a fun and festive way to celebrate spring! 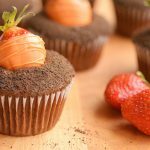 If you buy pre-made green icing and pre-made cupcakes (*cough* I’d never do that…) you can have these ready in about 5 minutes. You just need the right tools. I have been wishing for spring lately. Living in Canada, it seems to be taking its sweet time this year! Finally on the weekend some of our snow melted and we could see the daffodil sprouts just poking out through the ground. I’m not a seasoned cake decorator (at all), so I had no idea that you can buy coloured icing in a pre-made tube . 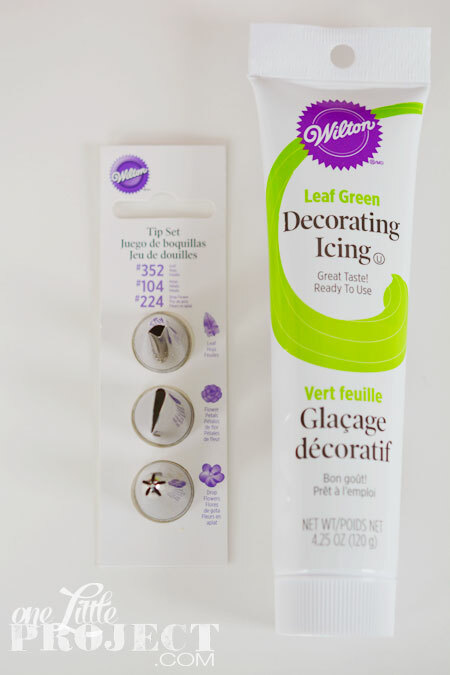 When I found it at the bulk store next to these leaf icing tips , I was so excited that I didn’t have to make the icing myself! I may or may not have bought pre-made chocolate cupakes and put them in my muffin tin. I’ll never tell. These gluten free ones even came without icing, which was perfect! 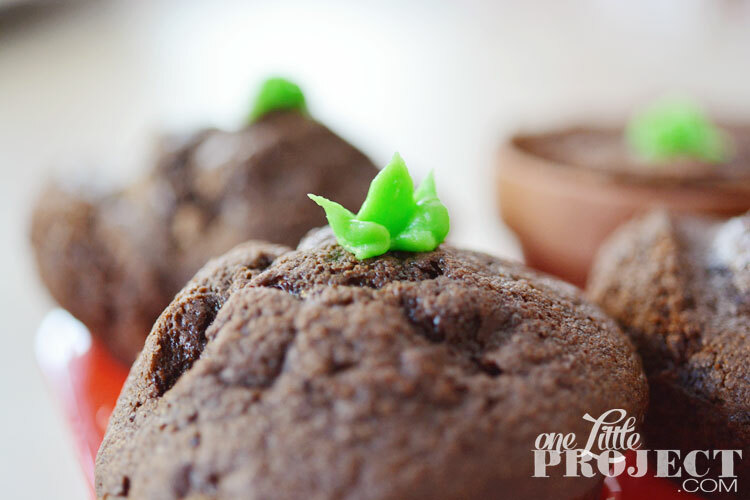 If you have more time and patience you can of course make your own chocolate cupcakes. 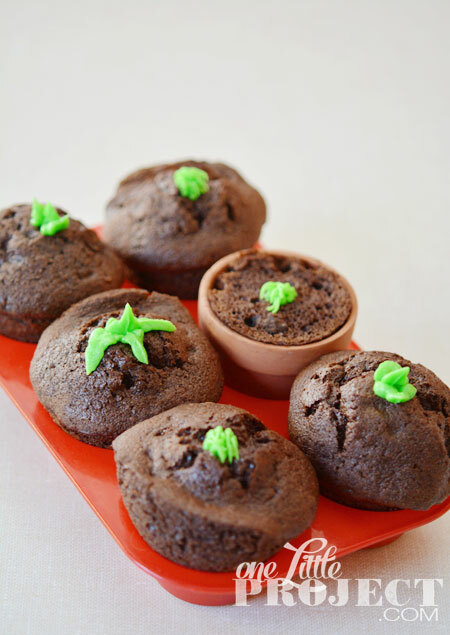 I recommend this recipe for chocolate cupcakes from scratch. 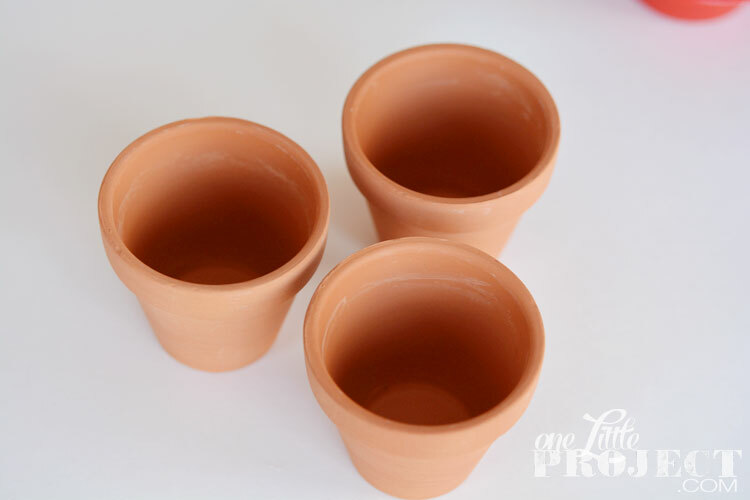 I picked up some little terra cotta pots at the dollar store the other week. 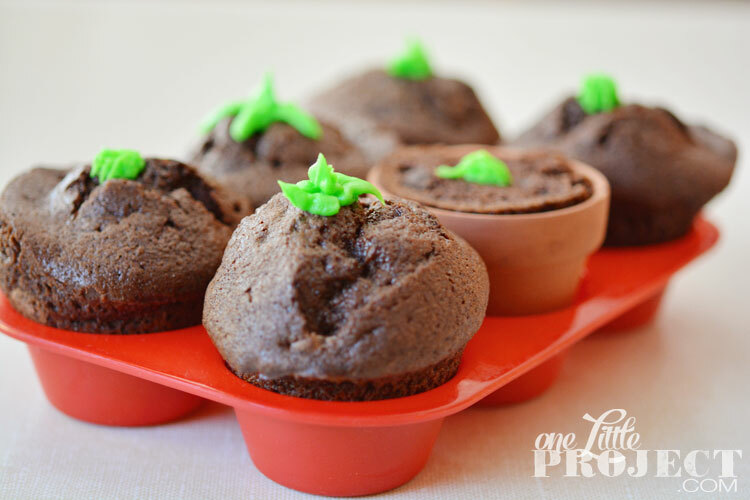 They are the perfect size for these medium cupcakes. It was like a gardening experiment in the kitchen! 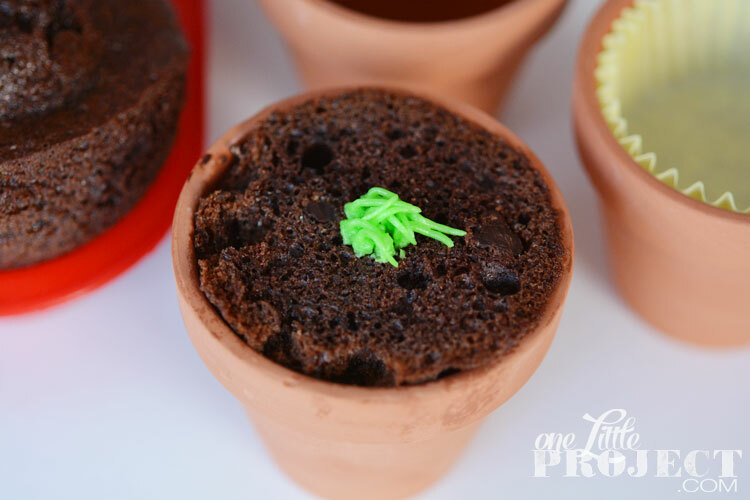 And ended up with a little cupcake sprout in a clay pot. How cute is that!? 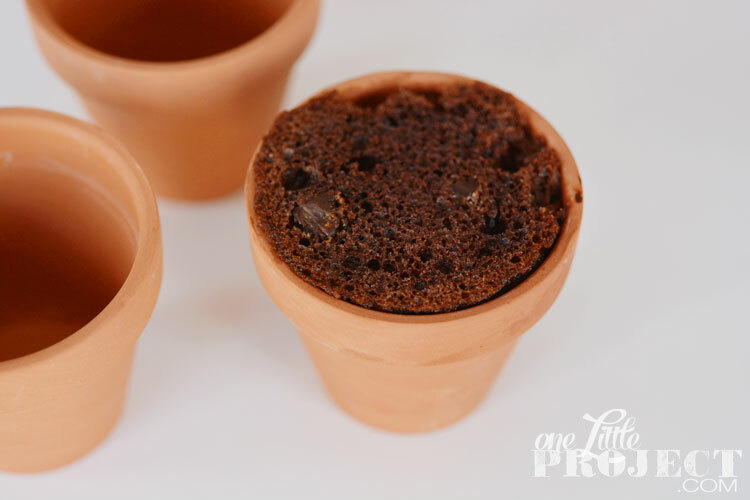 Keep in mind that these terra cotta pots are not made for food, so if you do use them, make sure you use cupcake liners to keep the cupcake from touching the clay pot. I know that this wilty looking grass is not the most impressive bud, but I’m pretty sure that this grass icing tip is my new favourite. 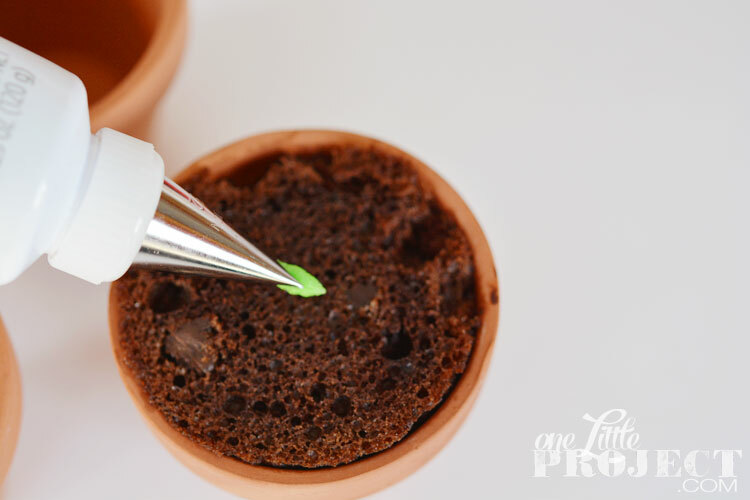 I would buy tubes of icing, just so I can cover treats with grass icing! Here are the tips I used. 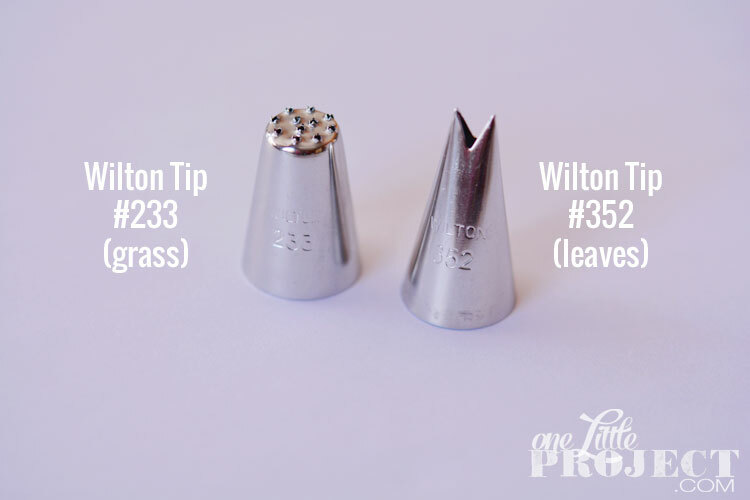 Wilton Tip #233 for the grass (SUCH an awesome tip! ), and Wilton Tip #352 for the leaves (still awesome, but this one requires more skill). The icing tubes were fantastic, because all you do is hold the tip on the end of the tube, and then screw a decorating coupler over top to connect it to the tube. 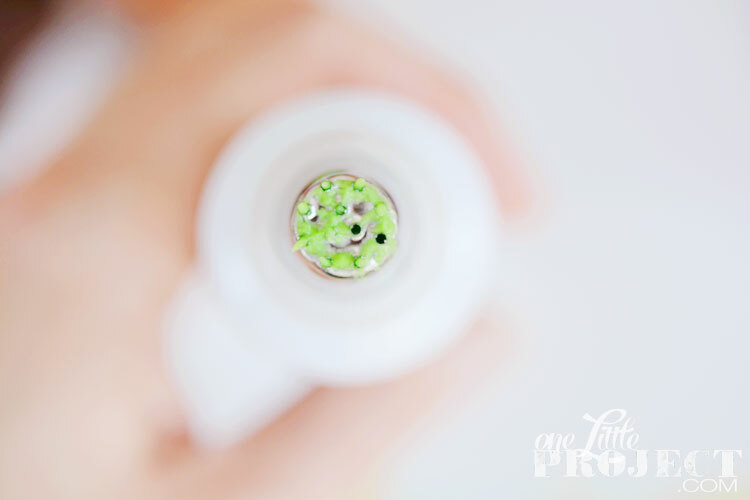 You can make your sprouts as large or small as you want to. I’m thinking I was somewhat motivated by the teeny tiny sprouts we have outside right now, so my buds are pretty small. And if you are better at cake decorating than I am, then I’m sure you could do even better. This is the first time I have ever made leaves, so they are by no means perfect! I love how it looks like the little buds are just sprouting out of the dirt! 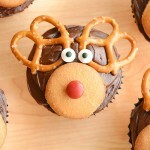 As long as you make the sprouts small, the icing will hold its shape without falling over. Eventually this icing hardens, but it’s tricky for a beginner (like me) to make the shapes perfectly. 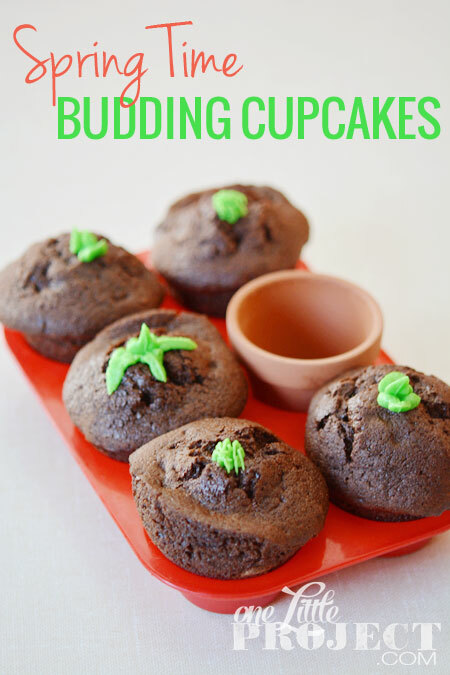 These budding cupcakes are so easy to make! 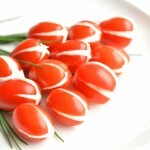 And they are such a festive and fun way to celebrate spring! 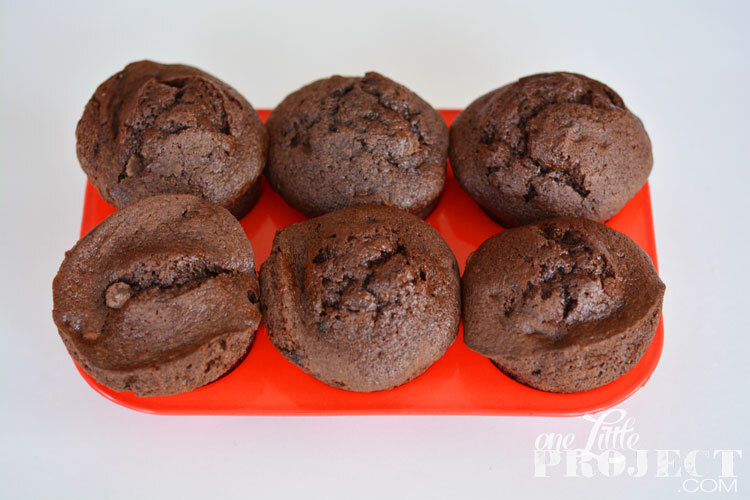 You could even make them on muffins if you wanted to attempt to make them a little healthier. 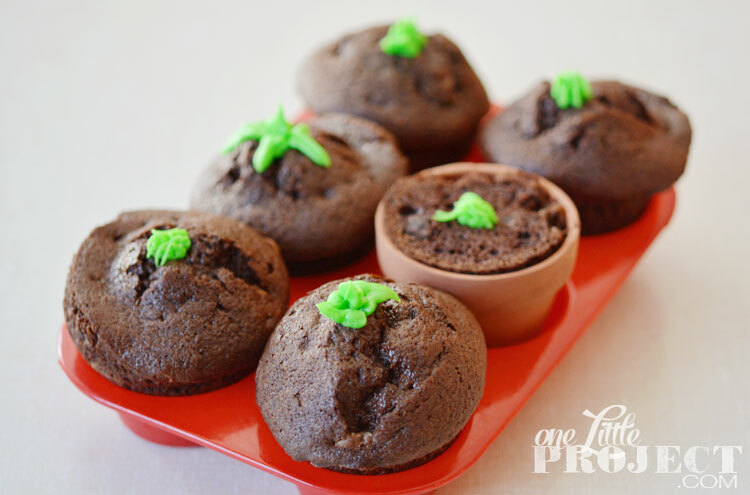 All you need is a dirt coloured muffin or cupcake (when you think about it, most cupcakes and muffins are dirt coloured…) and some green icing and you can whip these up in less than 10 minutes. 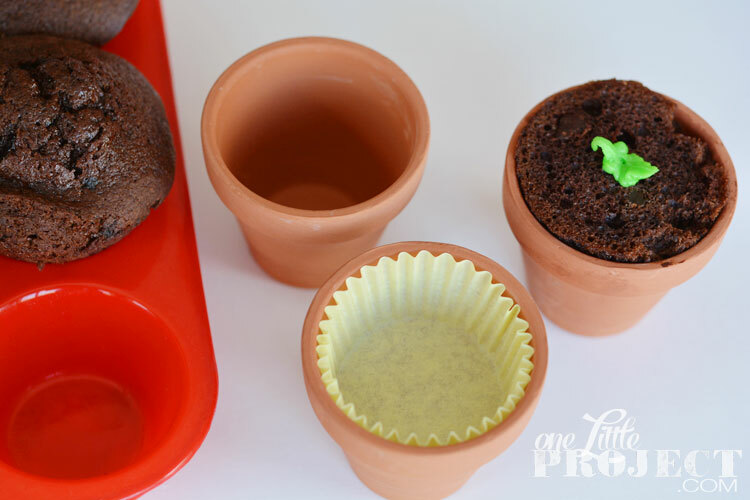 This is a great icing activity for a beginner!